We love cooking and creating fun things to eat in our house. My daughter loves throwing on her matching apron and mixing and scooping. So preparing for a fun 1st Birthday party we made these super cute Bird's Nest Cookies for our guests. These are great for any springtime party or Easter get together. My husband isn't a huge sweets fan but he LOVES these. Gather all your ingredients (Some not shown) and preheat your oven at 300°. Grab your little one to help you because this is a simple recipe that they can help you with. They love watching they're creation start to take shape and turn into little nest's. You need 2 egg whites in a large mixing bowl. Add a pinch of salt and whisk until frothy. Let your little one do the mixing for a moment and then you can do the fast stuff to make it frothy. Mix in your sweetened condensed milk and vanilla. Fold in your coconut. Then fold in sugar and flour. Mix and make sure all of it is good and coated. Line a cookie sheet with parchment paper. With damp hands put a heaping tablespoon on the lined pan. Push them together to make oval or round shapes. Then form it into a nest but pushing into the center. Make sure its all still touching and that you can fit one or two candies inside. Bake for 25 minutes or until the edges are golden brown. I've seen other recipes add chocolate to the inside of the nest to make the candies stay but we like them just the way they are. Less mess too. Take your candies (we used Cadbury Mini Robin Eggs because they look so real) and place them in the nest. This was my daughters favorite part. What a cute twist for Easter! What a cute little helper! I love coconut and bet those were delicious. Cuteness! That seems like a fun thing to try. I’m not a fan of coconut, but they look adorable! 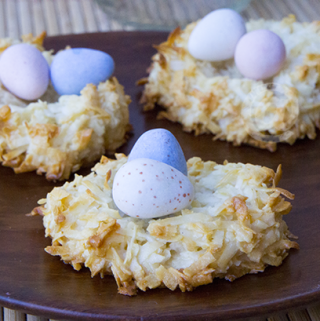 Those look so good, perfect for Easter dessert for the kids! I really love macaroons and this idea is adorable! I think I know what our family project will be next weekend. Those turned out absolutely adorable. NO WAY! These are so cute and I love ANYTHING with coconut! Oh, they look so good, and what a wonderful little cook! I saw these on Pinterest the other day — SERIOUSLY the cutest things ever! These are so cute! I may make them for my son’s class! What a great idea. I might have to do this! So cute! Those Cadbury mini eggs are my kryptonite! Love the photos and how easy these are! Those look SO good! I love anything with coconut. I love yummy Easter treats. They look so cute too! We do something similar with those chinese noodles and chocolate. What a fun idea! This is so cute! Will definitely have to try these! This is a great idea! Cooking can be so creative and fun! oh yum! And great that the kids can really help out with this one. So perfectly Spring-y. Love these Meghan! This looks so fun and I love that your daughter loves to cook. we love to cook too and macaroons are great, they can even be easily made gluten free. droooooooool. They look delicious and beautiful! What a cute recipe! She looks like she’s having a blast! I love making kid friendly things with my littles too, it’s a great way to spend time together! What a fun easter treat to make as a family!! The recipe ingredients are wrong! 2 tbsp of flour?! Cute pics but very wrong recipe! No the recipe is correct. This makes them easier to mold into the nest shapes. Trust me try it they taste fantastic!My whole neighborhood let me know. I made these, and about 15 minutes into the cooking process, I looked in and noticed that all the Condensed milk had come out, and was just sitting around the nests. Looks yummy. I love cooking with my son. I love how easy the recipe is! I was looking on Pinterest and I came across this recipe and another and I have plans to make these tonight! Can’t wait!